When it gets warmer, I do not want to wear heavy base makeup. I just don’t. I get to 12 o’clock and want to claw my face off when I wear anything really heavy. 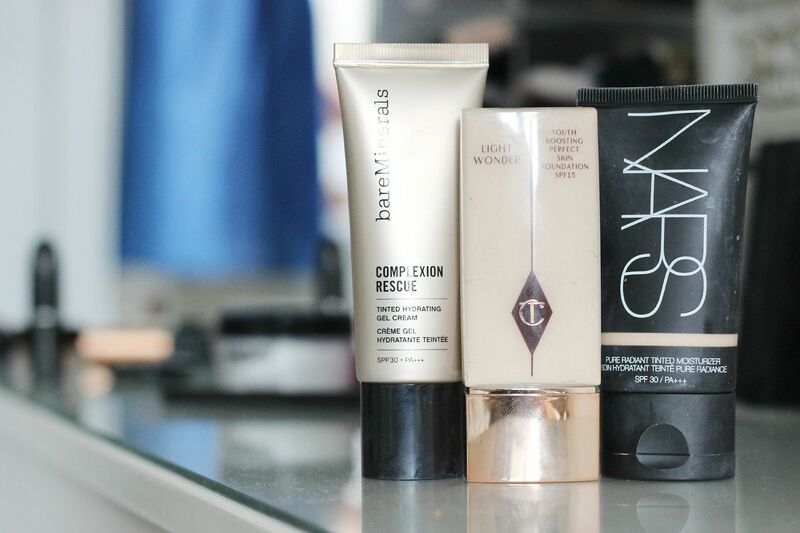 I like lighter products that feel moisturising but also not slippery and products that also give a nice amount of coverage and manage to make my skin look better. Oh, I also like my products to last all day. Something new and something exciting – the bareMinerals complexion rescue in Opal. This is the sheerest of the bunch, and offers a glow but not much coverage. Perfect for when you’re having a good skin day, or a no makeup makeup kind of mood but not one for if you want your face to go from zero to hero in 2 seconds. If you have really dry skin but just want your skin to look enhanced, this is perfect. Something with more coverage but just as much glow, the Charlotte Tilbury Light Wonder is the one that evens out your skin and makes you look… nicer. This does not last all day on my skin, so it’s not one for if you want to be able to not worry about your face all day and then go for post work drinks. Love love love this mixed in with MAC pro longwear, because then you get the best of both worlds. Lastly, I still love the NARS tinted moisturiser. It is a really really nice creamy base that adds some glow without being too sheeny. This one gives such good coverage for a tinted moisturiser and definitely lasts all day and it fades nicely without looking too harsh. Oh, and it’s hydrating and basically amazing and I think everyone should have it. This would be my pick out of all of them in you want one base for summer. What are your favourite bases for summer?